Located in Cardiff and commissioned by a "National" six-a-side Football Promoter, this new, purpose built Modular Building complex consisting of 7 No. individual prefabricated modular bays, provides a much needed Football Club House (295 sq. m) for their members. 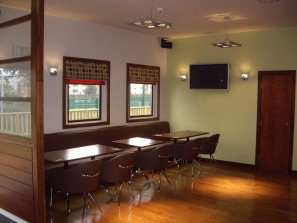 The design of this prefabricated building provides a generous and well equipped bar and seating area, male and female changing rooms with showers, toilets, locker rooms and an office. A fully compliant disabled toilet facility was also provided. Externally, the walls are finished with a combination of cedar boards and brick slips whilst the roof is constructed with our standard duo-pitch roofing system and hard wearing "Hypalon" blanket. Electrically operated steel roller shutters are fitted to all windows and doors for additional security. Internally, the walls and ceilings are finished with painted plasterboard and the internal doors are all solid core timber with closers and seals. Floor coverings throughout comprise of a mixture of hard wearing vinyl and luxurious carpet. Heating and hot water are provided by way of a gas fired boiler. An excellent Football Club House in which to relax after a tiring game!